She's Fantastic: DC Comics ViniMates - BATGIRL! 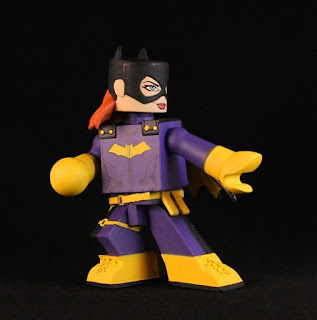 DC Comics ViniMates - BATGIRL! It satisfies a long-forgotten need of mine to finally be getting some Minimate products based on DC Properties. My first exposure to Minimates was the early C3 products way back in 2004. In that line we got a great Catwoman and Cassandra Cain Batgirl. Then in 2007-08, there was an official DC Minimate line which gave us a whopping seventeen female figures (Including my favorites, Harley, Batgirl and Batwoman). But in the 10 years since then there has been nothing (not counting the Gotham products). So although I would always prefer a traditional mini-mate form, I'm quickly warming up to the larger, pre-posed Vinimate design, especially if all my favorite characters are getting new product. This Batgirl and Nightwing 2-Pack was a 2018 FCBD exclusive. It had a shipment delay and didn't arrive in stores until mate May. I snagged it at my lcs last week. My only wish is that these figures offered some articulation. Just a neck or a single shoulder would add a lot. Let's check out Batgirl below! On its own, I don't love this locked-in pose for Batgirl. But I think once I get a few more figures, the pose will lend nicely to a group display. Here is Batgirl with her pack-mate, Nightwing. And with my other Vinimates so far, Roller Derby Harley and Arkham Asylum Harley.